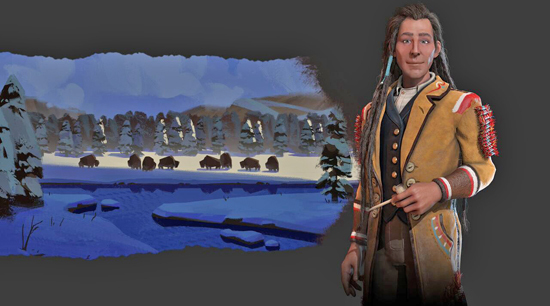 Poundmaker will lead the Cree in Sid Meier’s Civilization VI: Rise and Fall. Poundmaker was a highly skilled bison caller – a man who drew bison into pounds – and greatly respected among his people. He was also recognized as an outstanding orator and went on to become a great leader. In 1873, Poundmaker was adopted by the Blackfoot leader Crowfoot at the age of 31. Crowfoot had initiated a peace between the Cree and Blackfoot, bringing to an end an era of bitter wars and feuds. Poundmaker was given the name Wolf Thin Legs (Makoyikohin), and for the next few years lived with the Blackfoot. This greatly elevated his status with both the Cree and the Blackfoot. Three years later, the Cree were deeply involved in a treaty negotiation with the Canadian government. Poundmaker emerged as a leading skeptic of the treaty, objecting to some of the terms being dictated. He pushed for the inclusion of a famine clause, as well as assistance for the Cree in learning farming and trades. By all accounts, despite his earlier misgivings about the reservations and his reluctance to enter one, Poundmaker made every effort to learn to plough and farm to become self-sufficient, rather than rely on government rations. In 1881, Poundmaker served as an interpreter and guide for the Governor-General from Battleford to Calgary. The viceregal party was impressed with their guide’s nonviolent philosophy and cultural knowledge. He publicly encouraged his band to remain peaceful during this trip. This commitment to peace was shortly tested, though. In 1883, short supplies to the reservations and a reduction of the staff of the Indian Department, as well as the terrible winter of 1883-1884 led to starvation and desperation. By June 1884, war bands under young warrior leaders had begun to gather, and many groups, including ones led by the Cree leader Big Bear, assembled on Poundmaker’s reservation for a Thirst Dance ceremony to discuss the situation. Tensions increased over the next couple years with increasing skirmishes between the Cree and government forces. Then, on the morning of 2 May 1885, Lieutenant-Colonel Otter attacked Poundmaker’s camp, believing Poundmaker to be in rebellion. After a sharp skirmish, Otter and his men were forced to retreat. Poundmaker intervened to prevent the Cree and Stony warriors from pursuing the retreating troops, thus preventing further bloodshed. Poundmaker again intervened when his band captured a column of supplies intended for government forces, preventing the warriors from murdering the wagon drivers. Upon entering the nearby fort to calm the situation, Poundmaker and his followers were arrested and charged with treason against the government. Sentenced to three years in prison, he was paroled after a year at Stony Mountain Penitentiary. The year in prison had ruined him, physically and mentally, and he died shortly afterwards of a pulmonary hemorrhage, while visiting his adoptive father Crowfoot, on the Blackfoot reservation. Poundmaker’s historical reputation was restored after his death. His commitment to a lasting, just peace between the Cree and the government was born of foresight and dignity. During his life he had served as a personal agent of peace to end war between First Nations. He had negotiated in good faith and attempted to strike a conciliatory approach with the Canadian government. His legacy is now honored among both the Cree and Canadians today. His commitment to a lasting, just peace between the Cree and the government was born of foresight and dignity. During his life he had served as a personal agent of peace to end war between First Nations. His legacy is now honored among both the Cree and Canadians today.